2cm newspapers, 3 cm textual Records ,47 photographs. Allen Kennedy has been in the military all his life and he retired as a LCol. He joined in the the late 1950's.. Allen Kennedy's Father Tpr. Isaac Harry Kennedy G363 was born Jan 10th 1911 at Lincoln N.H. USA. He enlisted in Sussex New Brunswick 18 September 1940. His trade at time of enlistment was a Electric Lineman. He past his standard trade test with the 5th Canadian Armd. Regt 21 Nov 41 in group "A" Electrician. Kennedy received the 1939-1945 Star, Italy Star, France and Germany Star and Canadian Volunteer Service metal and clasp. 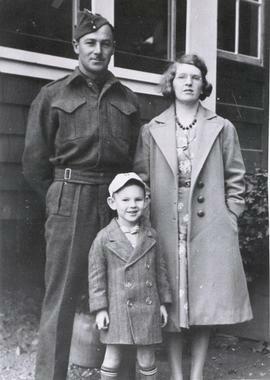 Trooper Kennedy was discharged in Fredericton 18 September 1945 . He stayed involved the the 8th Canadian Hussars association.